​​A native of Russia, Vlada Volkova-Moran holds diplomas from the Tula Music College, the Moscow State Pedagogical University, and the Moscow Tchaikovsky Conservitory as a musical educator, accompanist, and as a performing artist. While in Russia she was the principle accompanist for one of Moscow’s premiere children’s choirs, “Stellar”. While with the choir she toured all over Europe, won awards at many choral competitions, and performed for important figures such as Pope John Paul II, Alexi II Patriarch of the Russian Orthodox Church, and Boris Yeltsin, the President of Russia at the Palace of Congress for the 805th anniversary of Moscow. As an organ student of Professor Alexei Parshin, Vlada had the opportunity to perform on the organs at the Great and Small Halls of the Moscow Conservatory and at the State M.I. Glinka Music Culture Museum. Vlada moved to the United States in 1998 and currently runs a large piano studio in Santa Cruz and teaches organ privately. She is an active member of the American Guild of Organists and the Music Teachers Association of California and her students can often be heard in the concerts coordinated by these organizations. Vlada works as an organist at Peace United Church of Christ and serves as the main organist for the Diocesan Choir of Monteray, as well as being the principle accompanist for the Cabrillo Symphonic Choir and the Temple Beth El Choir. Vlada has also appeared in many concerts with the Santa Cruz Chorale, the Ariose Singers, the UCSC Concert Choir, the Monterey Chamber Orchestra, the Cadenza Orchestra, and many other local singers and instrumentalists. During her European tours with the Cabrillo Symphonic Choir and the Diocesan Choir of Monteray in 2003, 2005, 2008, and 2013, Vlada had the chance to perform on many of the interesting and historic organs of Italy, Germany, Austria, and Czech Republic. Between them was one of the largest in Europe at the Milan Cathedral, the organ of the Basilica Maria Plain in Salzburg and organs of St. Peter’s Basilica in Vatican on which she played for the Sunday masses. As a big fan of chamber music, Vlada often performs with the Santa Cruz Chamber Players and is a member of the Loma Prieta Ensemble and the Celebrated Piano Ensemble. 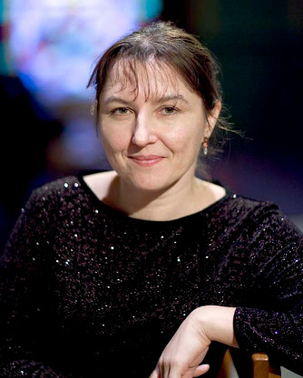 Vlada has performed in many organ recitals in the Bay Area. She was a featured solo artist at the Santa Cruz Baroque Festival and is the founder and artistic director of the annual New Year’s Eve “Organists Kaleidophone” concert series in Santa Cruz.